These were taken in a church in Alburquerque, Bohol, our last stop before retiring from an exhausting countryside tour. This wasn’t part of the itinerary. My companions, who were in the province three years ago for field work, wanted to stop by to see what has become of one of their favorite churches. Most of the others were destroyed by the 2013 earthquake and it was saddening to find piles rocks and rubble in their place – graveyards of the majestic structures that were once filled with visitors and echoed with prayers and constant camera clicks. It was my first time in Bohol. It’s a pity I did not get to see what it was like before the disaster. But I was grateful to this one church for giving me a glimpse of the past. At the time, there was just us, a small group of small people, the ancient structure with its painted ceilings and wooden columns looming over our smallness. 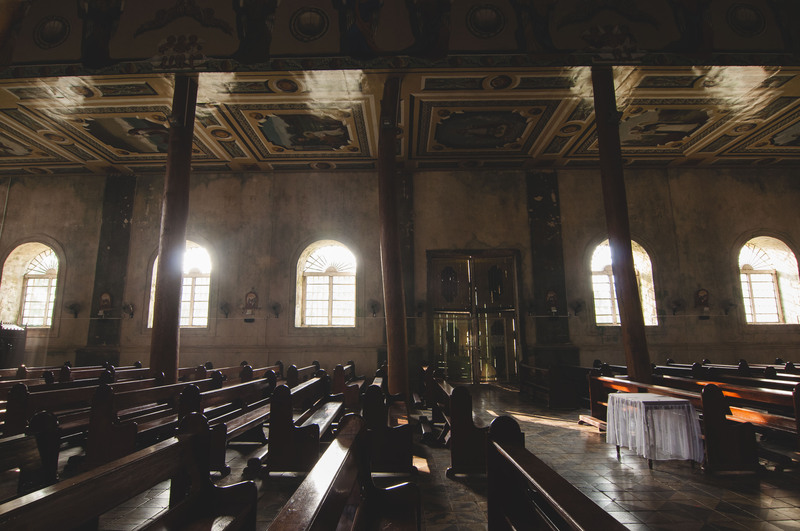 It was a place of quiet and solitude – in my mind, what churches are supposed to be. Sanctuary. They say that when you enter a church for the first time, you’re allowed to make a wish. I don’t remember making one during that time. I was taking photos (yep, I’m one of those clickers), trying to capture as much of this beautiful work of art as much as I could. But if I were to make a wish right now, right here on my desk, miles away from Bohol and that surviving church in Albuquerque, I wish only that we get to find more of these quiet places, these pockets of solitude. The world is moving so fast and everyone is trying to say so many things at the same time. It’s all very tiring and the world we live in doesn’t make it easier. There are problems left and right, the people we rely on can only do so much. Any day now, we could just reach our breaking point and fall apart from being bombarded by too much, by too many. But I wish that we find sanctuary, wherever we may be. It doesn’t have to be a physical place. I hope that we can have the courage to retreat into the quiet corners of our mind, sweep out the rubbles of daily existence, and simply wonder at the vastness and richness of life. Talk to God, maybe, or discover an inner well of strength that we could draw from. And through it all, amidst the chaos and clamor, I wish we find some semblance of peace. I didnt know we have a place named Albuquerque. Nice shots! Thank you! I made a mistake earlier, it’s actually Alburquerque. Sorry for that! Thanks for reading, Abelink ❤ I always go to your blog, too! !